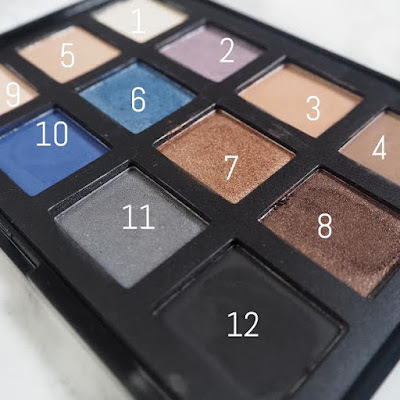 The palette contains twelve shades, that all pack some serious pigment! We have six shimmers and six mattes (well technically one of these has fine glitter particles in, but they don't really translate on the eye, so we're gonna call it a matte) and there is such a lovely selection of shades. In order for a palette to be something I'm willing to travel alone with or call a favourite, it needs to have a light matte shade, a matte black, and then some wearable neutrals, and the Epic Nights palette has all that and more. Plus it's completely cruelty free - Oh and its only £12? Need I go on? 1 - Creamy vanilla off-white. Opaque in one stroke and perfect for a matte brow bone highlight. 9 - Muted warm peach. Teeny glitter particles visible on hand/in pan but still really blendable. 3 - Beautiful mid-tone sable brown. Perfect everyday crease shade. Think MUG Creme Brulee. 4 - Neutral light-espresso brown. Not as pigmented as I'd like but lovely for deepening up the crease. 10 - Deep cobalt blue. So intense and creamy. Used on my waterline and DID NOT BUDGE. 12 - Jet Black. Super intense black, highly pigmented yet smudges out really easily for a grungy look. 5 - Stunning champagne gold. Really wearable and eyecatching, swatch doesn't do it justice! 7 - Foiled burnt copper. IN LOVE WITH THIS! Looks even more metallic with some Fix Plus spray. 8 - Deep chocolate brown. Leans cool-toned, lot of fallout on this one but so worth the colour payoff! 2 - Metallic pastel lavender. Slightly patchy, needs building up but beautiful for a pop of colour. 6 - Shimmering periwinkle blue. Wish the texture was more foiled like the bronzes, but still stunning. 11 - Slate grey. Great for deepening up cool-toned looks. Made me want to try a grey-mauve look. Shadow Selection: Nice mixture of mattes and shimmers, I would wear almost every shade in this palette and I love the intense black and vivid blues for jazzier days. Fallout: A couple of the matte shades do have quite a bit of fallout, even after tapping the excess off the brush. This isn't a problem for me as I always do my eye makeup first, but for those of you that like to apply your base before you move onto eyes, I would recommend baking (with translucent powder, not in the kitchen!) or keeping some wipes standing by! I think it's practically impossible to avoid fallout when shadows are this darn pigmented so I'm definitely not complaining. Price point = AHMAZING! It just shows that if small UK companies are only charging £12 for a palette full of high quality shadows, what are you high end peeps playing at? 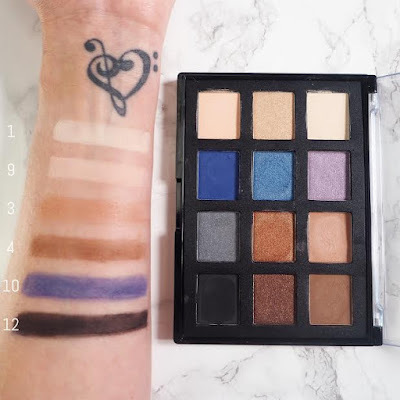 I've not heard of this brand - they look super pigmented, I love that even the paler shades look pigmented as sometimes I feel like they can be a bit of a disappointment in a palette! Wow, this seems like a great value palette! I'm impressed that you get such variety for just £12! I think you described the colours really well, so don't worry! Number 4, the neutral espresso brown, is definitely a shade I'd get a lot of wear out of! It's wonderful to hear that they wear so well too, and keep you looking preened to perfection all day! Thanks for sharing your thoughts, I can tell that a lot of effort went into this post! I've never heard of this brand but it's great to hear a small brand being cruelty-free and great quality for a small price! This looks like a great mixture of colours too! Yet another excuse I might have to find to buy another eyeshadow palette! If you've managed to pull of that blue then you're badass!! 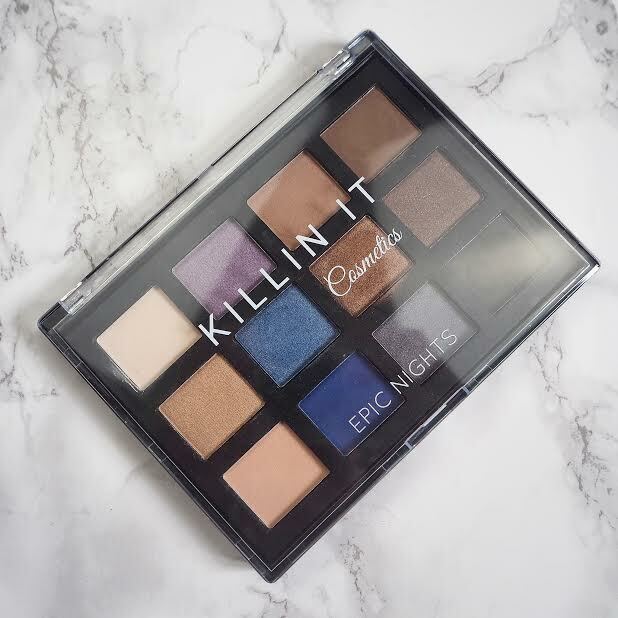 Its amazing how a palette like this is only £12! The colours are beauitful! 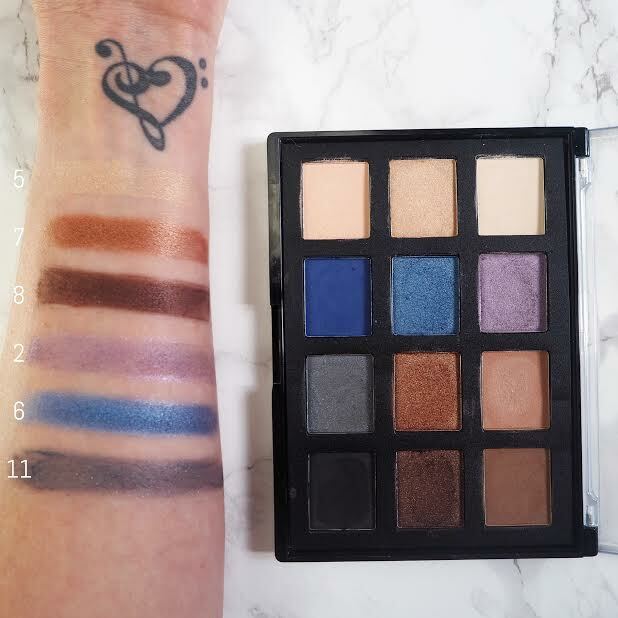 These look super pigmented, I love hearing about new brands to try! Never heard of this brand, but super intrigued now! That cobalt blue is absolutely stunning! I like that the palette is a mix of neutrals and more edgy shades as well. You're right,you don'thave to pay a lot to get great quality in cosmetics anymore. AwesomE. 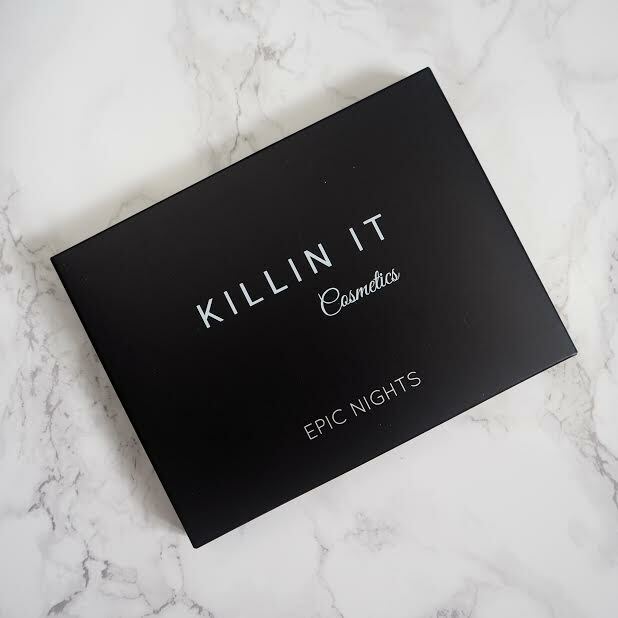 This looks like a great palette and yay for cruelty free. Also I think swatches can definitely be yummy. Number 6 is stunning! The whole palette is really well-rounded and flexible. Suitable for anyone, I think! And at £12 it's a steal. What a bargain! Firstly, YES I'm sure eyeshadows can be yummy hahahahaha! Secondly, SO CHEAP?! For the quality I can't believe how cheap this is?! The swatches are amazing. I really love no10! Such a lovely shade! I've never heard of this brand but the pigmentation has me all starry eyed! They look amazing! absolute bargain! defo need to get on this brand asap. Makeup is an important part of women's life and your makeup tips is really awesome. I can't imagine a single day without my makeup and Liquid Matte Lipstick.